I have been meaning to get involved with one of these compo’s for a while now — so here we go! Well, it’s back and this year I am going to enter something! I need to get cracking..
I’ve managed connect my PCI Catweasel card to pass-though on my ESXi server. I took a bit of work and it’s not perfect (ie no Joysticks or Mice work) but the disk subsystem works great. I added to my server a Multi Function 3 1/2 drive with USB reader, which I thought was a stretch to get working — but in the end it was fine. 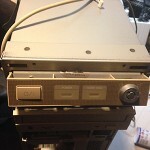 I also added a TEAC 5 1/4 drive which reads and writes perfectly. The Disk Imaging tools work reasonable well but get stuck sometimes. 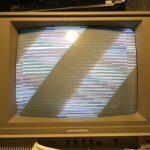 I tested some Amiga, Apple and C64 floppies and was surprised how fast they imaged or transferred down. Stability was an issue initially, but after making some adjustments to processor and memory layout of the VM, XP and the Catweasel card are working great. 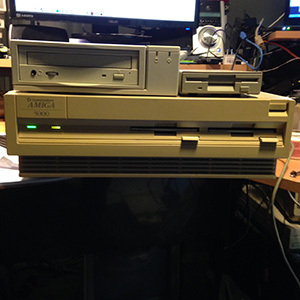 The other subsystems on the card are not used, but what I really wanted was a multi format disk reader and writer. Click on the thumbnail to see the desktop in action. 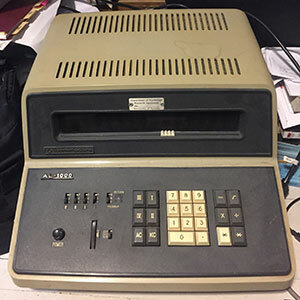 The Commodore AL-1000, which is akin to a mini-PET (heavy and boxy). 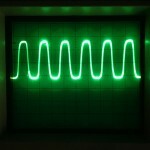 It uses tubes to display the numbers. There was some rough housing with this venerable calculator and it needed some TLC to get going. The calculator was abandoned a long while back and found after someone was cleaning out some buildings near by. A tip from a friend helped save this new addition. 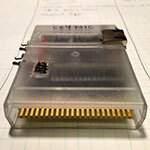 As of today, I made my first C64 cartridge. Most of my programming experience is either through floppy or tape based storage. Making a ROM/BIN file and getting it to work was a tougher than I thought. 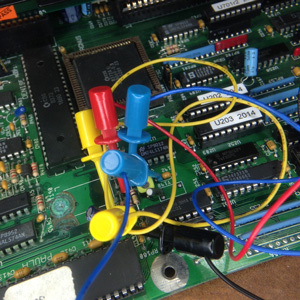 It was more problems with getting a CRT/BIN combo into the tool chain for testing in an emulator, than to actually make a cart and burn an EEPROM. My first cart is nothing amazing, but it pumps out the INC $d021’s. I have a few of these guys in a box, mostly for a long term project that I have been working on. I haven’t had much need for them in the last while as VICE has great networking support. Lately, it has been crazy fun doing TCP/IP communications with the IP65 networking stack. It’s definitely the way to go for making games that need updates from time to time. 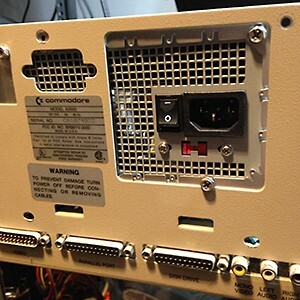 Write a bootloader that fits in ROM, place it in the socket and off you go. Yes there are issues with a ROM update later on and that you need to have internet access to enjoy the software. Oh well, its a connected world. One of these guys needs to get crossed with a 16 MB REU. It would be pretty awesome combo. But for now; this thing is still great. 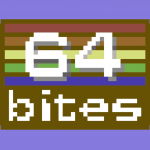 I will say three things about Michal’s c64 programming series: his video’s are fun, fast and packed with information. I am not a bad assembly programmer, -not the best- but not bad. After watching a few seasons of his videos I started to notice subtle ways to improve my style. There is a common problem with programmers in general. We need a problem to learn something and anything else in the way gets filtered out. So when Michal’s videos had Basic language sections, I was going to skip them for more interesting topics. I’m glad I didn’t. In fact, a few assumptions (over the years) that I’ve made were proven wrong (about the DATA statement in Basic). Suddenly, I wanted to know if there were other things that I was mistaken about. Before you complain about it being a paid service; its worth it. Its a good refresher and its interesting to see how he works and his logic. He even manages to get automated testing into the mix.. on an 8bit 64k machine. It’s worth the money and I’m happy when a new episode appears in my inbox. Well, the Gotek Floppy has been running relatively well. I dragged a bunch of of ADF’s over to a USB stick (with the menu ADF) and it was pretty much working. I wish the drive face was at least the right size, to fit flush with the enclosure. I’ve noticed a few problems here and there with some images; also when there isn’t a USB mounted you get a dead icon on the screen for DF0:. 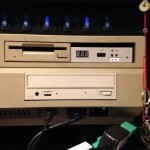 I’m testing a variety of floppy images to put it through the paces. I’ve even made a 3.x Emergency ADF and mounted it. I’ve had this one in the basement for a long time, never got it working correctly — until now. A3000D: Random problems finally sorted. Picasso IV with Audio add-on. 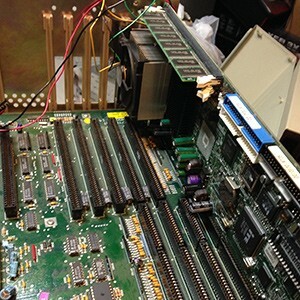 The mainboard initially had standard original custom chips (Ramsey 4, Super DMAC 2, Super Buster 7), which got upgraded to Ramsey 7, Super Buster 11. 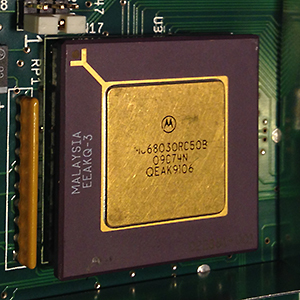 The WDC SCSI chip on the board was a type 04, which its now a type 08. 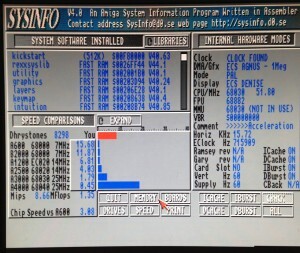 The fast ram (8MB) was a mixed bag of chips and speeds, but they were all static column type which gave the 10% boost. A newish SCSI drive, 8.5GB which replaced a 200MB drive I found in it. After installing the base OS, and the networking adapters — problems started to come out. Random checksum errors, enough to corrupt the drive a few times. After a few Disk Salv 4 sessions, I kept checking all the parts. I removed the all the cards but the NIC and still got the errors. I had already upgraded the SCSI chip, which should have stabilized the SCSI chain. I checked the diode at D800, its direction and the voltage inside, on the port and through the cable. I double checked the drive to supply power and termination already and everything was terminated correctly. Removing the BigRam+ for the remaining tests yielded a slightly more stable system, but the errors started coming back. I think I formatted the drive and installed the OS too many times, I was clicking and editing things while doing other things without thinking about it. The system would last a little longer with each tweak, then it would just get worse. 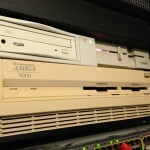 It’s really strange, my Amiga 2000 with a GVP Accelerator installed without a problem, ever!. For some reason I thought the A3000D was going to be open shut case once the repairs were done. This was not the case. I had a batch of 514402AZ-60 ZIP modules, which are supposed to be static column RAM, but are not. I thought maybe a homogeneous block of chips might help the stability, also I had 16MB’s of it. A 10% fast ram speed loss for system stability I can live with. I was reading though other people’s issues, when an article about problems with Ramsey/Super DMAC revisions. They are paired chips, according to many. Others state that sometimes the mixed bag works. I pulled my Ramsey and returned the original Ramsey. Well +1 to the Paired Chips theory, system is rock solid. 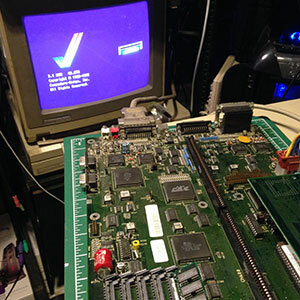 The A3000 was randomly deciding to output a proper signal to VGA. I know the monitor I was using (or LCD) was capable of displaying in the right frequency range — but only 1 out 5 power ups would yield an active VGA display. It was easy to tell when a good powerup would occur, as the VGA display would have some very dark gray vertical lines in the black screen. 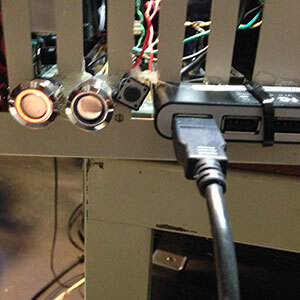 Putting a scope on the VGA port showed signals on the RGB and H/V sync pins. Each signal looked okay from a casual inspection (comparing a good powerup versus bad). I checked all the pins around the board to see if there was anything missing on the way in to the VGA… but if the VGA signals looked ok either way (on or off) then it must be a very slight signal variance. The variable resistor on Amber was very touchy. I had a spare that would work, but I re-soldered the old part just to be sure.. it looked like there had been some work previously done on it. Using a metal screwdriver, I noticed the signals jumping around on the V/H pins. Removing the screwdriver would change the signal as well. I had a plastic screwdriver for altering TBC signals — TBC’s did the same thing with metal tools. 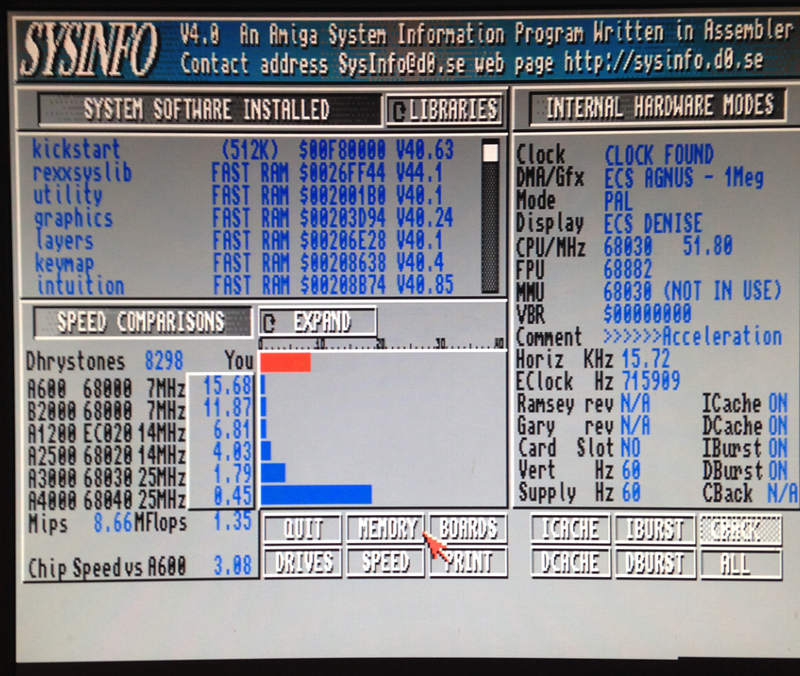 The A3000 I am working on has a few issues, the first was NO CLOCK reported by SYSINFO and other tools. This is of course true, as the battery had been removed after I unboxed this machine. 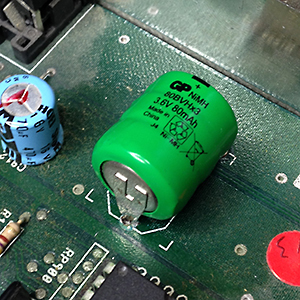 After the battery was removed, the gross damage to the motherboard by the leaking battery is obvious in the picture to the left. I cleaned the board as best I could, noticed that the back of the board was OK… somehow. I didn’t want to mess with the area around where the battery was, as there was a lot of damage there and I didn’t want to add to it. I temporarily jumped a CR2032 in a holder (the BLACK and RED leads), to get get the clock powered. I then went into the Prefs and set the time. After a reboot, the system recognized the clock — but the time had not incremented while the machine was off. The clock crystal was not outputting anything which ended up being a connection from C192 to R193 was lost. I jumpered them with the BLUE lead. After checking all the connections out I found C190 was not connected either, so i jumpered it with the YELLOW lead. 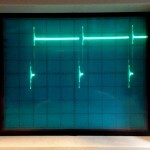 As opposed to a flatlined output from the Oscillator, I got a signal. I loaded up the system, reset the time powered it off and waited a few minutes. Turned it back on and the time was in sync. I went out for dinner, had a few drinks and came back — powered it up, clock still working. I know the clock is not so important in this day and age, as NTP can handle the time sync. But who wants a broken machine? 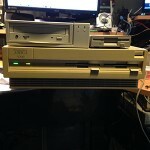 Well, I’ve got 2 Amiga 3000’s going, which means they are in 30 pieces on my workbench. Number Two, is an A3000T. I can’t think of a heavier computer. This one booted right off the bat, but for some reason the mouse and keyboard wasn’t working. 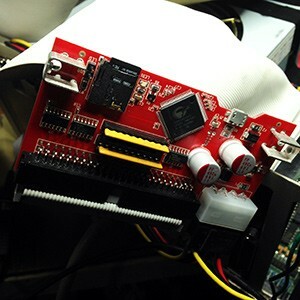 Scouring the motherboard for bad components/traces, reading forums and voltmeter came up empty. I could understand why one port would go or just the keyboard… but all three ports? The system would boot to a temp OS disk I mounted, but as soon as the OS was up (or even the KS screen) not keyboard or mouse action. Weird. Even the 3 finger salute on the KS screen.. 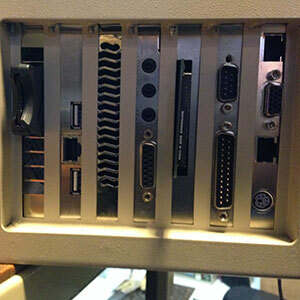 There is something to be said for computers with a keyhole embedded in its face plate. Yes, when in the locked position — no keyboard or mouse. Funny… I have never had this happen in the last 30 years. The trick that works on old bike locks (Plastic Bik pens, cut in particular way) works on the lock in A3000T. I can see that the lock has been man handled before. When I opened the lock, everything started working. After Brutalizing myself with the PCB45, I found a Canadian company selling UV Eraser and GQ-4X combo. Wow, the difference in setup is night and day… I know that this model doesn’t have clock support for the weird Commodore ROM’s, but as a general purpose ROM burner, this one was pretty easy to use. Well, this has been fun. Lets start with juggling soldering irons is only good for the dexterous — which strapping a brick to my solder station is looking like a better idea every day. Yuri got a batch of upgrades. Started with removing the battery, which was getting fuzzy. After reading all the debates about coin batteries or cordless phone batteries — I decided to use the original battery type. I made a small metal fold under the mainboard, so the battery could just snap into place, then be removed if needed. Hard to see and its actually jammed in there too. I have never taken the motherboard out of that machine, but after it was on the bench for a while I noticed that its pretty bendy, enough to pop the 68000 out of alignment. Many Yellow boot screens, then push push push.. ahh. I had a spare ANTEC PSU around, decided to get that installed. A jumper change on the main board, easy. I cheated this time and bought a power adapter. I had fun building the other PSU — but the adapter was cheap and I ordered a few other little things from amigakit.com (so why not). ATX PSU’s of course have a different component layout — but the ANTEC’s come with a handy metal jig/adapter you can screw on. A few extra holes here and there and the PSU was mounted.Not the most elegant mounting in the world, but not bad either. Fan’s in modern PSU’s seem to vent up not out the back, so I mounted the PSU slightly lower in the case. I’m going to try to find a slot based fan, to help with the heat in the machine. But power up! Who doesn’t hate interlace flicker. My eye’s were dying, along with one of my 1084 monitors. So the next addition was: Indivision ECS flicker fixer VGA adapter. I have to say, that OS3.9 and a reasonable resolution (sans le flicker) is pretty good looking (I used WB 1.3 in 4 colour mode for most of my life). I was always jealous of 2.04 ROM’s (friend had an A3000), but I loved my setup in the day. I wish I had taken the plunge earlier. Anyways, the card plugs into Denise’s slot and then Denise piggy backs on top. A grounding wire finishes up the install. A note to Denise pulling, use a screw driver — chip pullers are not designed for big ones. Just use a small flathead and pop the chip from each side and rock it out. The Adapter card, really really is a tight fit and requires a little bit of man handling. In the end, you can watch from an 1084 and the VGA at the same time. The back and forth is pretty amazing. I keep looking at my WB screen on the LCD — I really do like it. 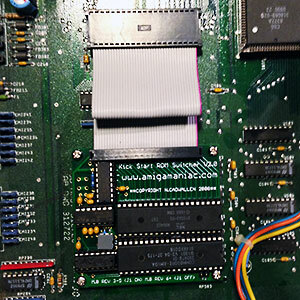 While the board was on the table, I kept screwing with the MegaChip2000 — which is still not working. So that’s going in a box until I can figure things out with that. The ROM switcher went from 1.3/2.04 ROM’s to 1.3/3.1 ROMS. I had decided to burn a copy of OS3.9 and give that a run. The install for that was slow. Well the CDROM was slow, part of me was wondering it floppy swappin’ would have been faster. 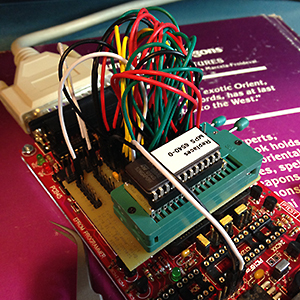 Getting the Hydra and the serial port card to go was interesting. The hyperCOM4 card is going to be an eternal pain.. Always keep copies of drivers. 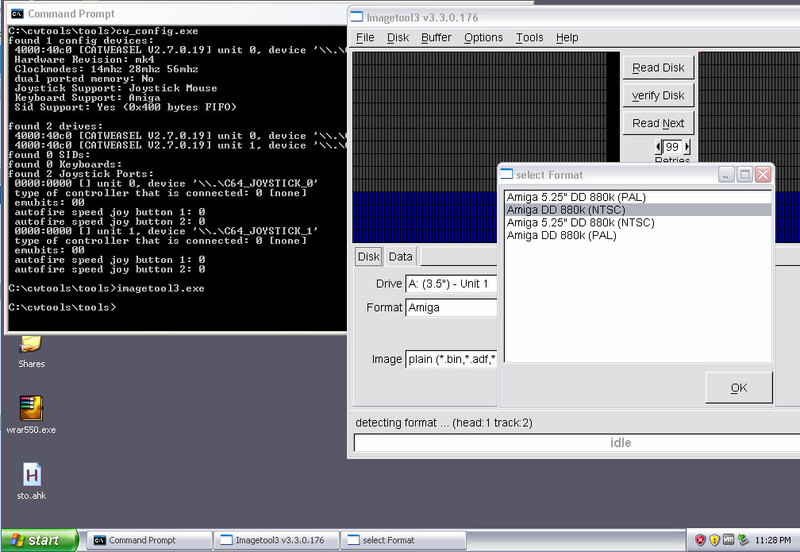 Configuring OS 3.9 was fun, but also interesting to compare modern OS’s versus anything Amiga. AML-C for copy, is annoying to do — who uses left control-c to copy on a PC? I’m sure there is one guy out there, but really.. getting my UI and operation reflexes took a little longer than I thought it would. Making ROM’s has been on my mind for a long time. Every so often the need arises, or so I have told myself. A while back I bought a Willem PCB45 EPROM burner, thinking I’ll be burning ROM’s every day till I die. It went in a box and life got in the way. Life got in the way of a lot of my projects. It seems that in burner market, there are hordes of these guys, well not all these guys. There are PCB4C’s, 5’s, 3B’s and others. Look up PCB45 and its really hard to locate any info. My cheap (serves me right) no manual or power adapter off of Ebay purchase was starting to piss me off. Download the latest version and you are out of luck. I needed to go back to a version that supported my hardware. Then you get the host of other problems of living in a modern world, software designed for 32bit XP which needs an actual LPT port. You know the first five minutes of plugging in a USB cable and wondering.. is this thing going to detect? Ahh its for power only. Managed to make a few C64 carts and PETROM’s. 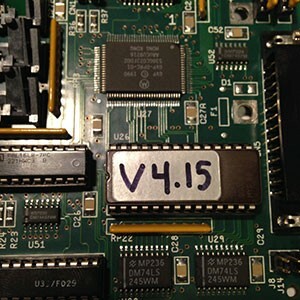 Looking into a few Atari Carts and maybe a GVP SCSI 4.15 upgrade for my Amiga. 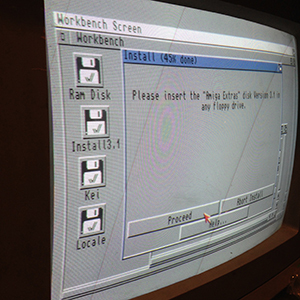 This is a busy week on the Amiga side of things, A4000:Kei is now up and running. I got this MB as part of a bulk sale of items from someone who was slimming down their collection. It came with a non standard card riser, floppy drive and OS3.1 install disks. A little while ago, I decided to start cleaning out the collection — items that work or can get working were going to be kept and the rest would be sent out onto Ebay. Getting this machine working was a little bit painful, as there was no PSU and the board had seen better days. Making an PSU was fun, but getting the MB connector was a pain. I am used to working with A2000/500’s and never owned a A3000/4000 type machine. It would have been a shame if I had to let this one go :). Making a PSU that was compatible required butchering of an old power supply, but after all the work I noticed it didn’t have a power switch. Arg. A little hack job from a dead PSU and everything was good. Once the power was working and verified, the black screen after all that work was really disappointing. Re-seating everything didn’t help. Spent an hour cleaning everything, contacts and the processor card. 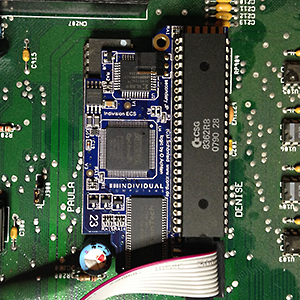 I think there is maybe two socketed chips (excluding the KS) on the whole board — not like previous Commodore gear I have worked on over the years. After the cleanup I noticed I was missing a few jumpers, added them from a dead MB in the basement. Went back to reading about A4000’s and their issues. The original battery was there, and looked like it had some leakage, but nothing that bad (will have to deal with that soon..). After moving cables around one of the PSU cables fell on the processor card and suddenly the KS screen popped up. I took a look inside the processor card and there was a toothpick in the slot, laying flat at the bottom. A little upside down shake and it dropped out. 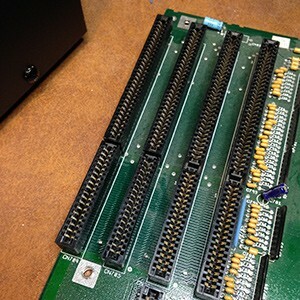 A push of the processor card into place and the KS screen appeared. That was a first. 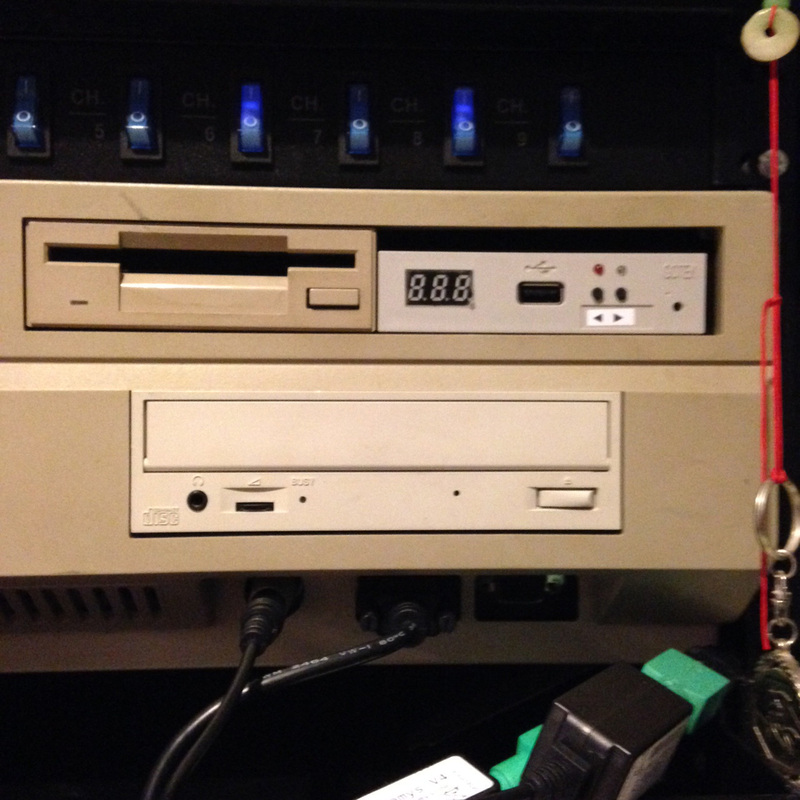 The floppy drive booted the OS3.1 Install disk without issue. It was amazing to see that go. I was surprised that the disks actually worked. 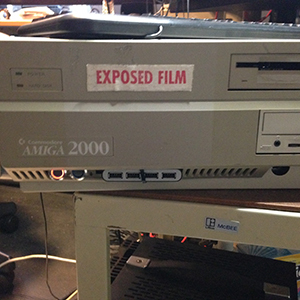 Most of my original Amiga disks are questionable at best. Bitching about SCSI issues over the years, I thought that going to a simple IDE interface was going to be the least of my problems. 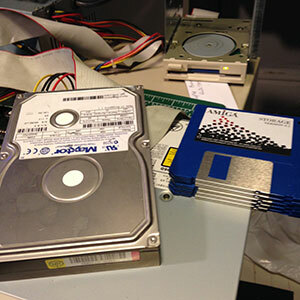 I have crates of old IDE drives, most of them are 10GB and above. There are reams of IDE cables in a bin. Brought up stack of everything, set the drives to master and went crazy for a few hours. Nothing would work. Black screen, sat there for minutes still no boot from floppy. Unhook the drive, the floppy would boot after a period of time. Swapped out cables, drives and combinations of configurations. Mounted the drives on a PC to verify them. Maybe they were not that compatible, with the IDE in the Amiga. Back to the basement, more drives must be here somewhere.. maybe something smaller? Ohh, theres a box of DVD/CDROM’s. I’ll grab one of those for later. After a few more hours of waiting for a drive to boot, I went for a walk with a friend. Came back, wondered what would happen if I hooked only a CDROM up. That did it, the system booted to floppy right away, no wait. Weird. Installing a CDROM at the end of the chain (set to slave), with HD in the second slot (set as Master) allowed the system to boot. HD by itself, no. With the CD, yes. Being spoiled by Windows/Apple Partitioning systems over the years — going back to the Amiga partitioning software gave me the old feeling of — I can really screw this drive up. I recalled some of the drive size requirements for various versions of the OS. So the first drive I made 500 MB and then a second partition that was 2 GB. Looking at the space left, the max visible from this OS was ~4 GB. I’ll have to sort that out later, to get the additional space back. I was pretty amazed with the OS3.1 installer. It actually worked and was painless. Yuri, originally was a KS 1.3 machine. When she got upgraded, I had a spare set of OS 2.04 roms and used those. But nothing says backward compatibility like installing a rom switcher. KS 1.3 is what the majority of games run under, so being able to switch between roms is a good thing. 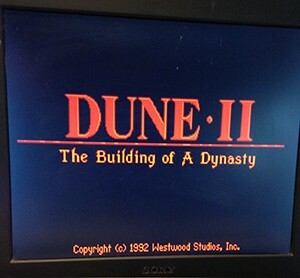 The guy who makes this, no longer exists on the net (www.amigamaniac.com). I had to go to a web caching site to find a link that would get some installation info. I just had the device and no instructions. It’s pretty obvious what to do, but in the end it wasn’t that straight forward. Under the roms in the socket is printed ROM 1 and ROM 2. All the chips on the board face one direction. The sockets didn’t have an obvious notch. So I followed the crowd and placed the roms how the rest were, which was wrong. After flipping them around, and looking for pin 1’s around the front and back — I noticed the notch. My coke bottle glasses should have seen it — but it was really small.